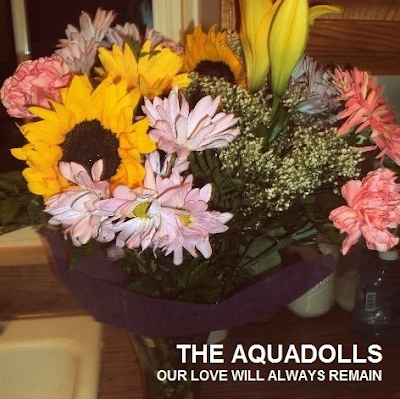 The Le Sigh: Track: The Aquadolls - "Our Love Will Always Remain"
Track: The Aquadolls - "Our Love Will Always Remain"
Get stoked for The Aquadolls' upcoming album with "Our Love Will Always Remain." We first fell hard for The Aquadolls this past winter upon discovering their We Are Free EP. They reminded us of all the cool things about being a teenager during summertime, and impressed with their ability to write catchy garage tunes but also serious love songs. As summer finally rolls our way, they have dazzled us once again with their shiny new single "Our Love Will Always Remain." This track is the first sneak peek we have of their upcoming full-length Stoked On You. In the last year The Aquadolls have seemingly skyrocketed in popularity; gaining attention from Lucy Miyaki of Tashaki Miyaki (who will be co-producing their debut album with Joe Cardamone) and Burger Records (our favorite California label who released We Are Free on cassette). In many ways, "Our Love Will Always Remain" is a milestone for the band – one of the first indications that their sound is maturing, evolving, and in general, becoming all the more awesome. While definitely a song about love, this is not your average love song. Lead singer Melissa sings verses quickly almost as if reciting a riddle or a poem, and then slows down for the melting chorus "The flowers that you gave me on the table / They may wilt but our love will always remain." Heartfelt oohs and aahs, poppy guitar hooks, and a catchy melody, all against a dreamy surf backdrop. This is summer love at its finest. Listen to The Aquadolls on bandcamp.